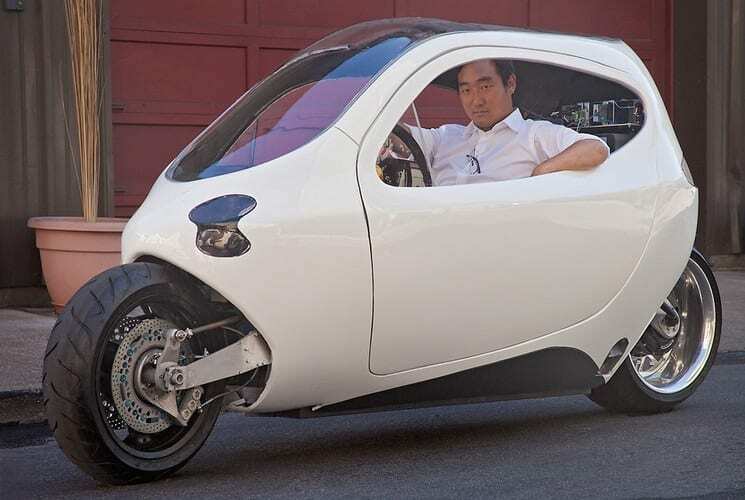 Home Innovation Can A Mutant Electric Half-Car, Half-Motorcycle Disrupt The Vehicle Market? Can A Mutant Electric Half-Car, Half-Motorcycle Disrupt The Vehicle Market? Will people embrace the futuristic design enough to make the startup a success? The Lit C-1 doesn’t look like any car you’ve ever seen, but it still can go 120 miles per hour and gets 200 miles on each charge. The first thing you see upon walking into Lit Motors’ three-story warehouse in San Francisco is the shell of a Land Rover Defender. It is, oddly enough, the inspiration behind the two-wheeled electric vehicle startup. When he was 23, Lit Motors Founder Danny Kim started a car production company and began the process of converting two Land Rover Defenders into biodiesel powerhouses that could get up to 32 miles per gallon. But then one of the Land Rovers nearly killed the now 33-year-old Kim when a vehicle stand failed while he was welding something onto the chassis. His next thought: Why do vehicles have to be so big and heavy? The answer is that they don’t. The C-1, Lit Motors’ first product, looks like a car sliced in half. It’s the kind of thing that has less of a chance of maiming you while repairing it. But that’s not what makes it so interesting. The mutant one-seater electric vehicle is, according to Lit, the first gyroscopically stabilized “rolling smartphone”–not literally, but it has a touch screen that can integrate with a driver’s smartphone. Kim spent years figuring out the design for the C-1, which has a metal shell and two gyroscopes under the floor that keep the vehicle upright even in the event of an accident. This thing may look from the outside like an encased motorcycle, but it acts like a car, right down to the steering wheel and foot pedals. In many ways, the C-1 is superior to electric vehicles that are already on the market. It gets 200 miles to the charge, it’s relatively cheap (the vehicle will cost $24,000 when it’s released in 2014, with prices going down to $14,000 by 2016), and it can squeeze into tiny parking spaces–a boon for anyone living in a crowded city. But Lit will still have to get over one big hurdle: the unfamiliarity factor. This thing looks strange, which will certainly appeal to some people. It will leave others with lingering questions about safety, highway-readiness (it can go on the highway and has a top speed of 120 mph) and whether it can actually stay upright. “They are going to need a lot of user testing and proof that this is going to work for ordinary folks to be able to demonstrate to people over and over and over again that this is going to be safe, efficient, and economical,” says Jonathan Koomey, an advisor to Lit and a Research Fellow at the Steyer-Taylor Center for Energy Policy and Finance at Stanford University.